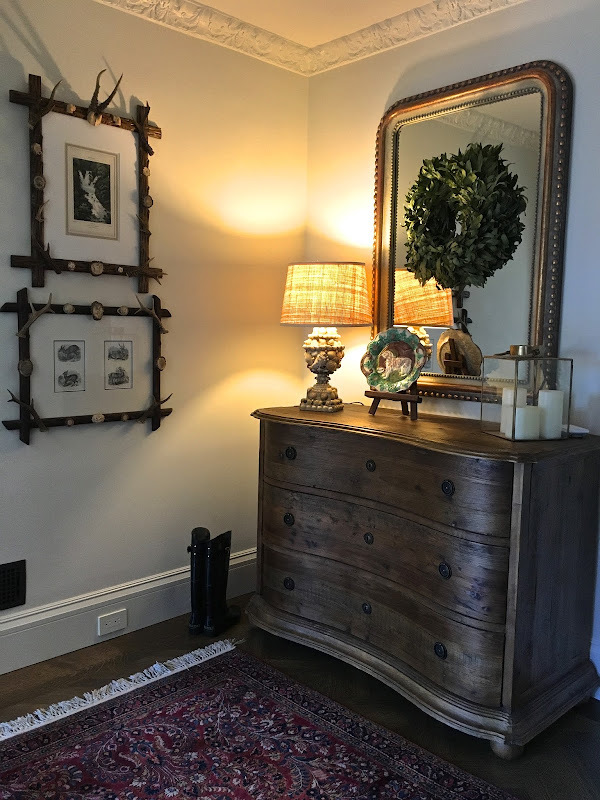 The entry was the first room I designed, beginning with this chest that I bought ahead of time from Horchow. I always knew that the shell lamp would live on the chest and that I would have a Louis Phillipe mirror over the chest. I found the perfect mirror at Ballard Designs. ...two antique oil paintings with gilded frames that compliment the mirror much better than the antler prints. 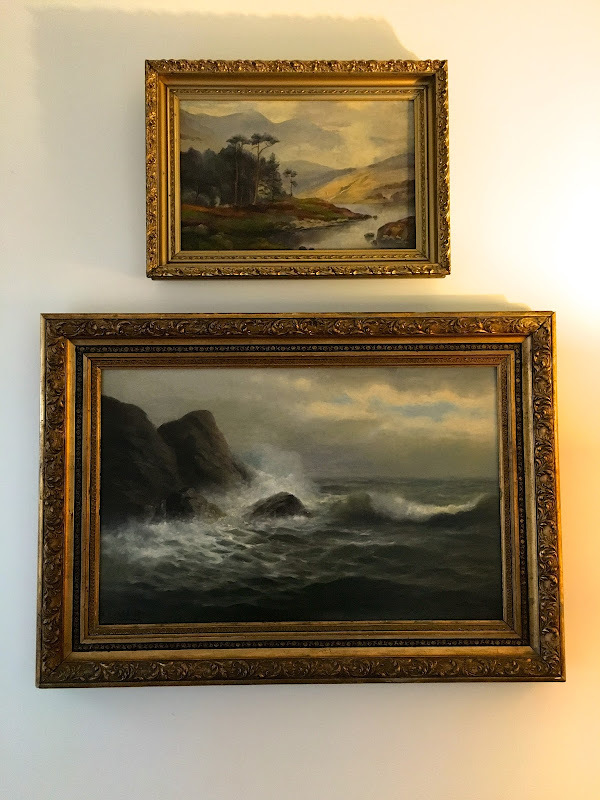 Eventually, I would like to find another nautical painting to replace the small river scene. The large painting is of the San Francisco Golden Gate, before the bridge. A real treasure and one of our favorite finds, Circa 1900. I felt that it belonged in the entry, complimenting the shell lamp and representing our location and roots. The entry as viewed from the living room. I like how Mrs. A's Persian rug fits perfectly here. It was a pleasant surprise. The flowers are from Mother's Day! Upon entering the house, a long hallway takes you to the stairway leading to the family room and lower level as well as the kitchen to the left. And here is the front stairway as viewed from the front door, looking down towards the street. I recently added the urn and topiary, trying to give the street entry more appeal. I designed an iron rail for the right side which is in the works. Stay tuned for the street entrance reveal with its boxwood, wall fountain and creeping fig. I wholehearted agree. The paintings are beautiful and do represent your area wonderfully. They compliment your entry so well. This looks more like you than the other arrangement. 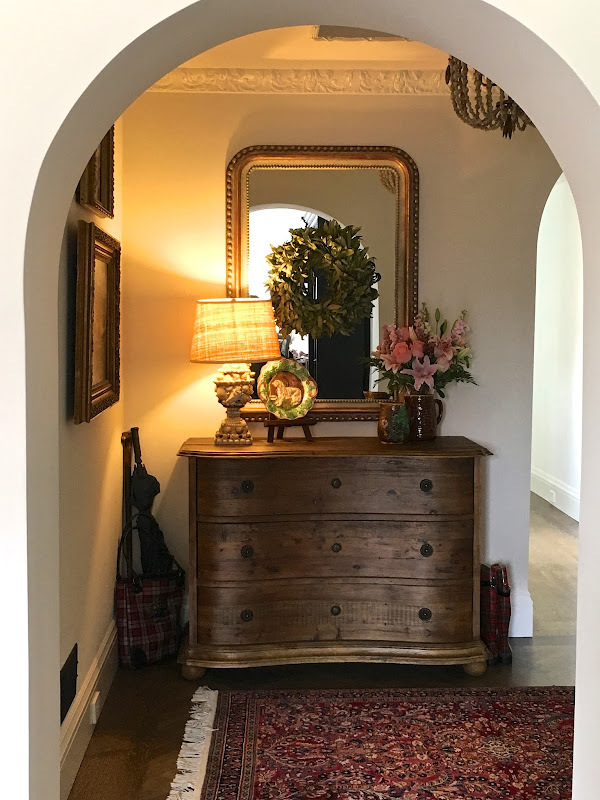 Beautiful space to welcome those who enter your home. I like the paintings in the beautiful frames with the mirror. Curious where the other pieces will land in your amazing new home. It's fun to follow the progress. Hi Delores! I don't often comment but LOVE your blog & really love the addition of the oil paintings to your entry. I agree that they are a lovely accompaniment to the mirror. Your elegant & warm entry is a beautiful introduction to the rest of your lovely new home. Wishing you years of happiness & good health there! I always get so excited when I see a new post from you! I love the oil paintings in that spot. A beautiful entry! It's all so pretty! I love your 1900 painting -- imagine that -- before the bridge when it was wild so to speak. Those paintings!!! What a perfect place for everything to harmonize, right when you walk in. Very welcoming. Love the oil paintings Delores - so up my alley!! We may have been twins separated at birth. This is so me - have a vignette in my house almost identical. 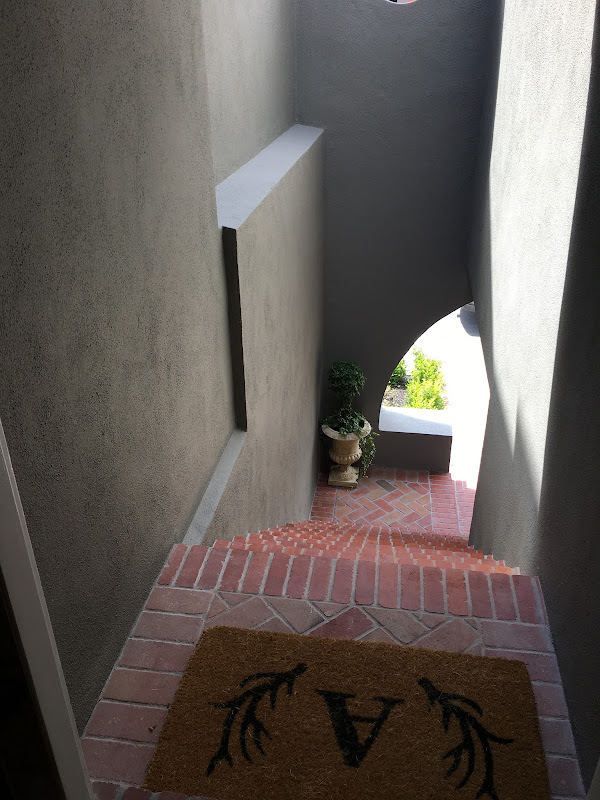 I love the brick steps up to your door - beautiful. That crown molding is unbelievable. I can't imagine any new construction homes having that kind of detail. Everything looks fabulous. Gorgeous!!! Love the antique paintings- and I covet the large one;) xxoj. I love it when you post. The house is dream worthy. Wonderful entry and the new pictures are such a perfect choice. Wow to imagine the bay with out the big bridge! Love the stairs leading up to your door. For an mostly enclosed area it looks very bright and attractive. How exciting having the new handrail made- it's going to look fabulous I'm sure! Either way, your entry is lovely. Actually perfect! Love this! Love your style! I'm a long time reader, and can't wait to see the rest of your new place! What a lovely entry foyer. I do like the paintings in the gilt frames, they work well in that space. Nicely done!